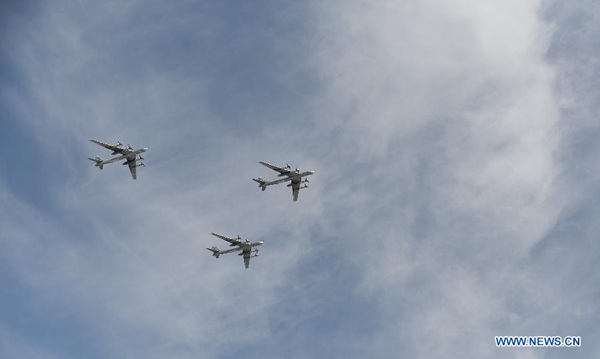 Two Russian Tu-95MS strategic bombers have been accompanied by U.S. F-22 fighter jets on a patrol mission over the neutral waters near Alaska, the Russian Defense Ministry said Wednesday. "On April 17, 2017, two Russian Tu-95MS strategic bombers successfully performed the regular aerial patrol mission as scheduled. The flying route was above the neutral waters of the Pacific Ocean, along the Aleutian Islands," the ministry was quoted by the RIA Novosti news agency as saying. The flight lasted more than seven hours and the bombers were accompanied by U.S. F-22 fighter jets for 27 minutes, the statement said. Russia's Long-Range Aviation regularly carries out patrol missions above the neutral waters of the Arctic, the Atlantic, the Black Sea and the Pacific Ocean. All such missions are conducted in strict compliance with international regulations and with respect to national borders, the ministry said. U.S. media reported earlier that two F-22 fifth-generation fighter jets on Tuesday intercepted two Russian bombers near the coast of Alaska.